Our organization involved in manufacturing and supplying huge array of Metal Handrail. Offered array is highly sturdy in construction. Being the leader in the industry, we offer our esteemed clients an exclusive range of Stainless Steel Handrail. This range is installed in the balconies of homes, malls, hotels, offices and more. The strength and appearance of the array is next to perfect. Stainless Steel Handrail does not corrode even when exposed to moisture or water. 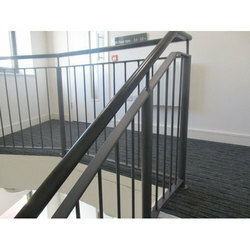 We have mastered the art of providing the clients with Mild Steel Handrail. Offered product is made using mild steel that is rust proof and very strong in nature. The array is installed in homes, apartments, offices and many more places. Mild Steel Handrail is designed by experienced professionals who conduct various tests ensuring the supreme quality of the range.